1 Fawn had seen spring. It was green. Fawn had seen summer. Summer was green and hot. Fawn had seen fall too. Green leaves had turned to red, orange, and yellow. The wind turned cool. 2 Time passed. Fawn saw the grass turn brown. The leaves on the trees turned brown and fell. The wind blew cold. Then white flakes fell from the sky. The snow made the land pretty, but it did not help the little deer. Fawn needed to eat. She was growing up. She needed more food. She did not want to eat brown, dry grass and leaves. She could not eat snow. 3 Fawn sat down to think. Her home was not the same. She had no green grass to eat. Maybe she should look for a warmer home. Maybe she should find a cave and sleep until the snow melted. She hoped green grass would grow again. She did not know what to do. 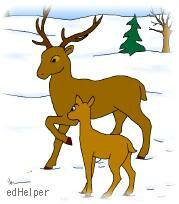 4 "I have a warm coat and body fat to keep me warm," Fawn told herself. "All I need is some food to eat!" 5 Fawn saw her friend, Buck. She trotted to meet him. "Hello, Buck!" she called.